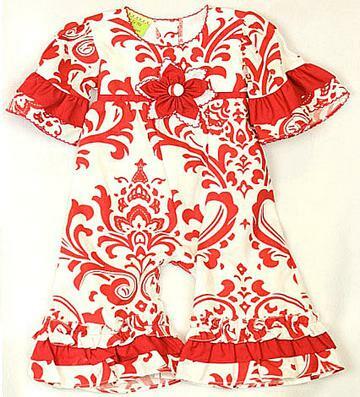 Your little girl needs to look gorgeous in this red and white Longall. The white with red scroll flowery print is bold and perfect with the flower in the middle of the chest that has red string coming out and wrapping around the back to tie in a bow. This is perfect for gathering the fabric to fall flowy. Thee sleeves are 3/4 length and have two rows of ruffles on the hem. The same ruffles are on the ankles and there is snaps along the inside of the legs to accomodate diaper changes. The extremely comfortable longall is 100% cotton.